Babalon equals: 282 in English Gematria and 47 in Simple Gematria. Shki equals 282 in English Gematria and 47 in Simple Gematria. In the Art of Ninzuwu, the foundation is in Shki and then one ascends from Shki to reach Zhee. While Shki is attributed to Shihotsutsu-no-oji, is can be said to be an aspect of Izanami-no-Mikoto and the spaces between Zhee and Shki are the spaces between Izanagi-no-Mikoto and Izanami-no-Mikoto as seen in the Zhee symbol, the two circles of the right angle. The Art of Ninzuwu differs from more popular Shinto traditions as the “Fall of Man” in Ninzuwu-Shinto, is seen as the separation of Izanagi-no-Mikoto from Izanami-no-Mikoto. Thus, the goal of the Initiate is the reunification of the divine couple within our being. This life course is simulated even in the Soul of Fire practice. If Izanami-no-Mikoto is equivalent to the Thelemic Babalon, it would mean that Izanagi-no-Mikoto’s attempts to rescue the former represented an ancient rite of initiation that is still practiced in Thelema but with a different aesthetic. The purpose of this rite of initiation founded by Izanagi-no-Mikoto would thus breed enlightenment, which in the Shinto parable is seen as Izanagi-no-Mikoto’s cleansing of himself and the three divine powers of Amaterasu Ohkami, Tsukiyomi-no-Mikoto, and Susanoo-no-Mikoto, are born. The Nihon Shoki describes the birth of these deities, in some accounts, as the result of Izanagi-no-Mikoto’s cleansing of himself, his eyes and nose. Sight and smell indicate the powers of the molecular world (smell) and those of the electronic realm of light (sight). When the Initiate completes the initiation, as put forth in The Ivory Tablets of the Crow, they are working in the realm of Shki. 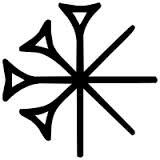 Remember that in each Vasuh letter are all nine letters. Yes the Tao Te Ching will be another post. Thus we find that no sacrifice or ritual work is done in the Ivory Tablets of the Crow outside of incantation, so as not to commit one to the netherworld, and can never leave. The goal is the reunification, the completion of our being. Beginner occult students may not be aware of this, but often times when all the letters of a word are capitalized in a grimoire, it represents a word that has a significant gematric value. In this case we find the word “THELEMA” in capital letters indicating that we should examine the words numerical value. Thelema equals 384 in English Gematria and 64 in Simple Gematria. Tiamat equals 384 in English Gematria and 64 in Simple Gematria. Nuit equals 384 in English Gematria and 64 in Simple Gematria. The Yi Jing Apocrypha of Genghis Khan associates Tiamat with the Book of Changes, commonly known as the I Ching. 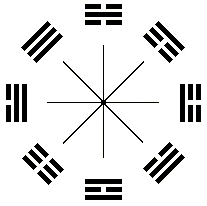 The foundation of the Yi Jing can be found in the bagua, which are the eight trigrams often used in Taoist cosmology. Is it possible that THELEMA, like the term TIAMAT, which it shares an identical gematric value, represents the workings of the Yi Jing? The Three Grades, described in The Book of the Law, also reflect the initiatory structure of the Ordo Templi Orientis, commonly known as the O.T.O. However these Three Grades are very similar in structure to the trigram, of which the 64 Hexagrams are based upon. Coincidentally, the term THELEMA equals 64 in Simple Gematria. However, when the look at the Gematric equations of the term Ninzuwu, we find that the meaning of the passage in the Yi Jing Apocrypha of Genghis Khan becomes very clear. Ninzuwu in English Gematria is 768 and 128 in Simple Gematria. Choronzon in English Gematria is 768 and 128 in Simple Gematria. Ninjutsu in English Gematria is 768 and 128 in Simple Gematria. While the term Ninzuwu is used to describe a state of consciousness associated with the divine light of love, it is also used to describe the tengu, who are said to be the founders of the Art of Ninzuwu. In our article, entitled, The Tengu: Protectors of the Shinto Mysteries & Founders of the Art of Ninzuwu, we discuss this in detail. in any event the tengu. In any event, we find some deep similarities between the Tengu and Choronzon. Choronzon is said to exist in a spiritual wilderness, the dweller in the Abyss. He stands between at the “crossroads”, sort ot speak, before the adept reaches enlightenment, wherein the destruction of the ego must occur. Interestingly, in some traditions, Sarutahiko-no-Okami is said to be an ancestor of the tengu. Sarutahiko-no-Okami, in a similar role to that of Choronzon, is described in the Nihon Shoki as the ‘guardian of the eight crossroads.’The Tengu are also associated with Susanoo-no-Mikoto, who, like Choronzon, is perceived as a sort of trickster deity, but teaches through karma, as often seen in Shinto mythology. Nyarzir in English Gematria is 666 and in Simple Gematria 111. Pazuzu in English Gematria is 666 and in Simple Gematria 111. This concludes the first part of our study, but not our investigation.